A morning without espresso? That’s just plain depresso. 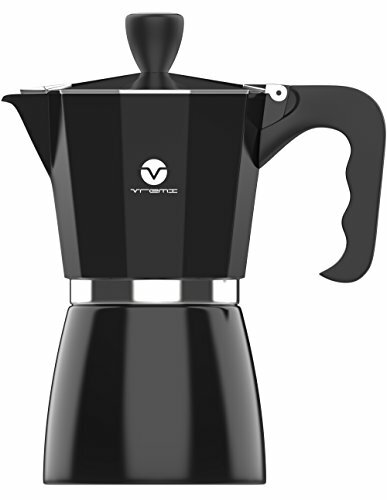 Make every day more brew-tiful with the Vremi Stovetop Espresso Maker moka pot, and get moving with an authentic Italian buzz, no matter which side of the bed you wake up on. A simple espresso machine that makes full-flavored espresso in no more than 5 minutes, reliable to brew excellent coffee fast so you’ll be ready to face the day ahead. Store out of reach of children. This is not a toy. DO NOT use steel wool or abrasive products to clean. DO NOT place hot espresso maker on unprotected surface. Never place extracts, powders, oils or instant coffee in the filter or vessel as they can clog the filter plate. After use, do not open the pot until it is cool. Periodically check the funnel to ensure it is functioning properly and replace if necessary. Clean regularly after each use. The warranty for this product will not be valid if any part is replaced with non manufacturer approved spare parts. Do not touch when hot.